This one was there in my drafts for about 2 years. Now that a long time considering that I was trying to create a utility. Now what was/is this about, it is about a thread on Network54 where Cameron Lackpour talked about adding a graphical interface to the OutlineLoad.cmd. I thought well that it is a good tool to work on (considering the number of switches you have to remember to make it work). I was surprised when I got a call from my ex-colleague, asking about the possibility of running that on a Linux machine. This prompted me to create a java version so that I can run that on Windows and *nix systems. So here we are jMnDLoader, the tools provides you with a graphical interface for OutlineLoad utility. 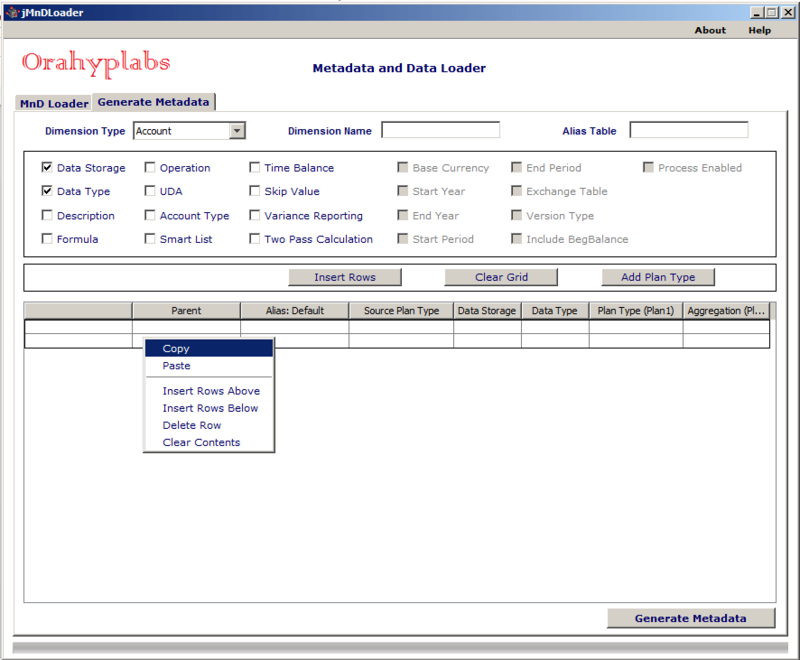 It has an option where you can generate MetaData. This is not a client version, it needs to be executed on the Planning server. Tool makes intelligent selections for you 😉 as you can see for Dry run, it’ll not lock the dimension and rest of the options are not enabled. You can generate Metadata using the tool. I’ve added a help file to the tool, you can find more details on how it works there. 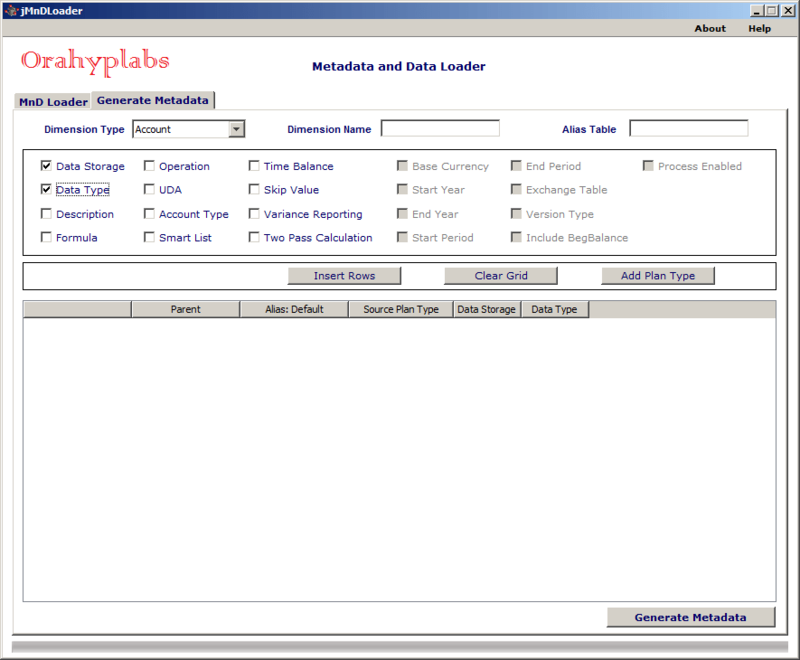 I’m planning to integrate EPMA metadata generation and if all goes well, maybe an interface for the infamous EPMA batch client. You can download jMnDLoader from here. I've actually been doing some work back in 11.1.2.1 – had to dust off the old batch scripts that I used to build metadata. I'll pull down a copy and have a play. Thanks for releasing it! FOR /F "tokens=2*" %%a IN ('REG QUERY "HKEY_LOCAL_MACHINESOFTWAREJavaSoftJava Runtime Environment1.6" /v JavaHome') DO set "JavaHome16=%%b"
FOR /F "tokens=2*" %%a IN ('REG QUERY "HKEY_LOCAL_MACHINESOFTWAREJavaSoftJava Runtime Environment1.7" /v JavaHome') DO set "JavaHome17=%%b"
You can do some basic IF missing on that to work out the version. 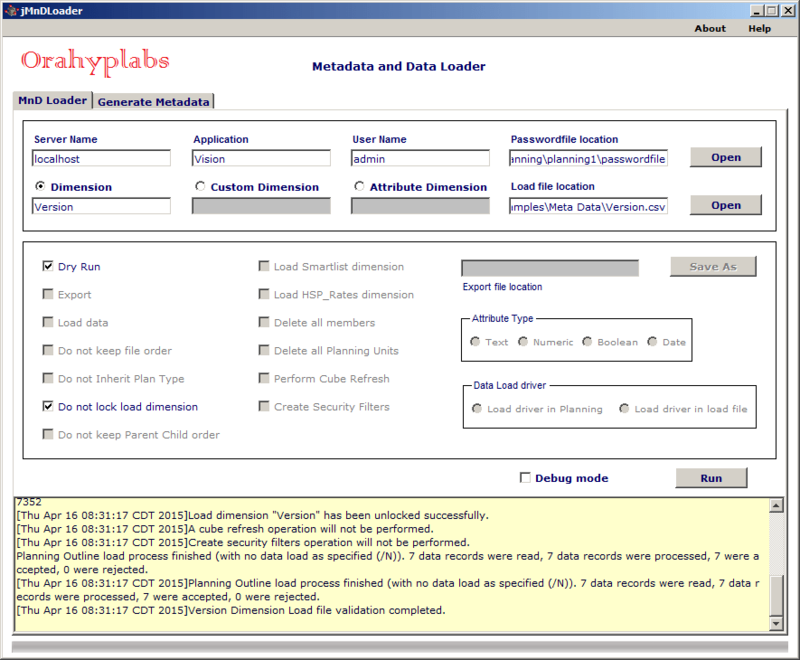 Also – you can use the %HYPERION_HOME% environmental variable to get the path of the Hyperion implementation. I think that later changes to %EPM_ORACLE_HOME% (not sure which version) – but a similar lookup is possible. Check out the SMCS. 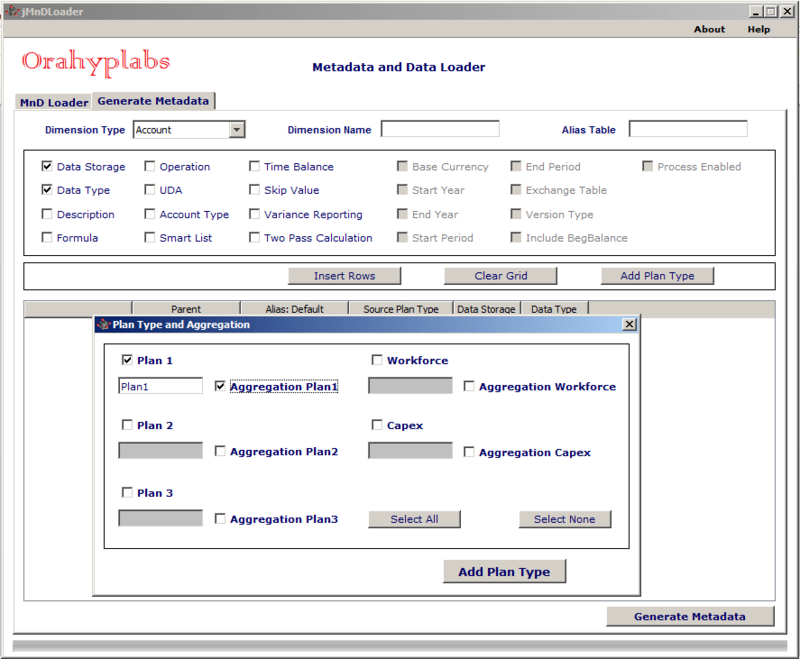 We're working on client version which would enable load to EPMA version directly from Excel. In testing stage as of now but it's going to be exciting soon.